A short history of bonnet cones: Having spent over 15 years servicing and restoring Triumphs, we know that these little chaps in their original design just dont last - which caused slightly irritated customers to ask why the cone was having to be replaced every service. Consequently we designed a bonnet cone with an inbuilt steel baseplate which meant they lasted at least a couple of years rather than the 6 months that the previously available ones lasted. We have now designed a polyurethane version with in an inbuilt steel cone - we think these should last indefinitely. The polyurethane ones are suitable for the Herald, Vitesse, GT6 and Spitfire - they don't fit the TR range as we had them built as big as possible to take advantage of the large housing available on these cars to reduce bonnet rattle to a minimum. We are working on a TR version which will be available soon. 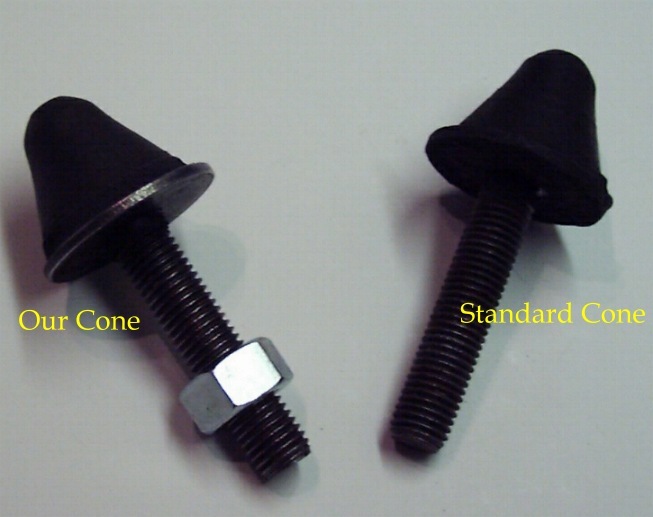 These bonnet location cones are manufactured in hard shore rubber and have a bonded steel support baseplate. They are also fitted with the correct length stud, unlike some currently available.